A modern modular signalling system is now available to enhance the realism of your Free-mo layout. 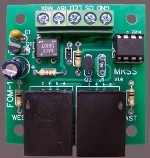 The Signal Cascade Module FCM-1 has been designed for quick and easy installation that will get your signals operational in no time. Two support modules, the Optical Detection Module, FOM-1, and the Block Detection Module, FBM-1, are for use on layout modules that do not have signals, yet require train detection for signals on adjacent modules. Two Turnout Modules route signalling information down the selected route. All five of these boards form part of the Occupancy Bus to provide realistic absolute block signalling for your Free-mo layout. The Free-mo signalling standard was originaly developed by a member of the Northern California Free-mo Group. Gregg Fuhriman designed a signalling system which uses an Occupancy Bus to send signal data from one layout module to the next. This is done by connecting block detectors, optical detectors and signal drivers using cross over category 5 cables. The signalling modules developed here follow the standards used by the Northern California Free-mo group. These modules were designed to simplify wiring and reduce the number of components required within the signalling system. They use the same occupancy bus standards making them fully compatible. On the technical side, there is one exception to the modules shown here. Although the last pair of wires in the cat 5 cable are internally connected from one RJ45 jack to the other, they are not tied to ground so that they can be used for other signalling options in the future. All the modules shown here are microprocessor controlled to provide smooth signalling with no flickering of signals that usually results from dirty wheel sets or optical senors that are not sensitive enough to detect rolling stock. The FCM-1 board is an all in one module that has signal driving, block detection and optical detection through an external optical sensor. Full details are available on the FCM-1 page. The FBM-1 provides block detection on layouts that do not have signals but detection is still required. In addition to the block detection, an optical sensor is required between blocks in order to detect rolling stock that does not draw current. More information can be found by clicking on the link below. The FTM-1 allows occupancy signal bus information to be routed through a turnout without signals at the turnout. 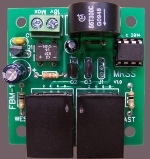 The FTM-2 allows occupancy signal bus information to be routed through a turnout with signals at the turnout. More information is available by clicking on the link below.